I am giving a guided tour of my sketchbooks, art journals,and art books of the past. Check out part one and part two. 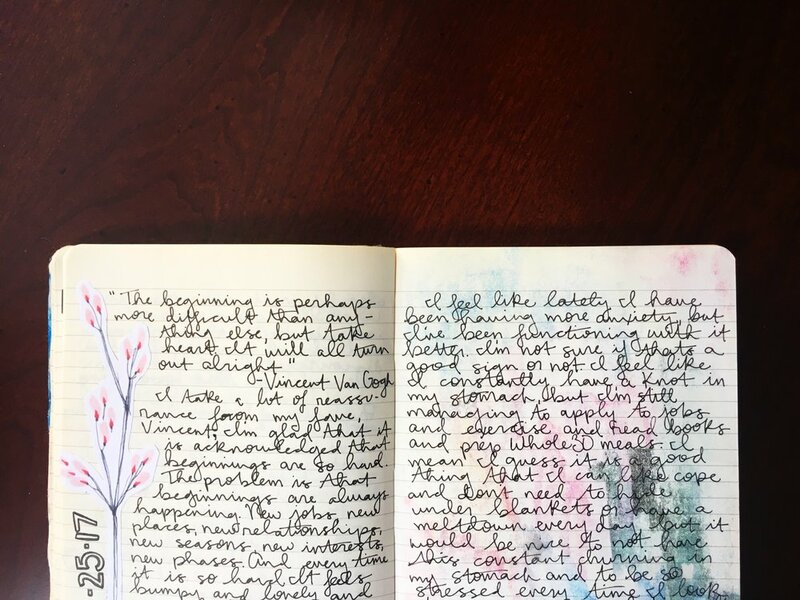 Today, I'm getting into one of the things that trips me up whenever I go to write one of these posts: the difference between an art journal, a sketchbook, a journal, and something else. To me, a sketchbook is a place for drawing, a place to practice and to work out ideas. An art journal feels like a place to make more "finished" artwork (I could write a whole bunch on that idea as well), but it is also a place for more personal, emotional work. Not a place to go to practice but a place to go when I had a message to impart or something to express. My first two art journals also seemed to be a place for art and when I would get an urge to just write in my art journal I felt the need to make it look more pretty or more interesting than just words on a page. It felt weird to flip through an art journal and come to a page with just writing or of sketches that were completely random and unfinished. It felt weird to flip through a sketchbook and see paint. But I still felt the need to include these "off topic" pages in my art journals and sketchbooks. I started to get really tired of all of the restrictions and the pressure I was putting on myself. I just wanted one book where I could just write or just make art or just sketch or stick in anything without feeling like I was betraying the purpose of the book. So I created my first "anything goes" journal. The book was made out of a lined Moleskine cahier journal. The pages are extremely thin, so I stuck two of them together so that the pages would hold up to more media and writing without bleedthrough. I embraced the "anything goes" idea by collaging the cover with stickers and scraps - anything I found and liked. I worked on the cover over time as I worked in the journal, instead of all at once. (Fantastic "not your babe" sticker from Starchild Stela, C.S. Lewis quote card from Elise Joy, fantastic mermaid sticker (and most of the others) from the dollar store). Lots of lists and little notes. And space for random extras of photos, like this one of a strawberry illustration. This is the first journal that I took with me while traveling. I brought it with me while visiting family and friends in Ann Arbor, MI and became completely hooked on travel journaling (more on this in future posts). I loved capturing small things in the moment, like the shape of the hotel room key and a list of what I saw, ate, heard, felt, etc. And I'm obsessed with collecting interesting bits of paper (like that coffee sleeve), so a travel journal is the perfect place to put them. At this time I was also super inspired by Teesha Moore (her membership site, the Artstronauts Club is a wonderful fairyland of happiness and creativity) so those two quirky little people in snowsuits are completely inspired by/learned from her. Again, lots of writing. Still loving bold statements. Using Tim Holtz distress stain to make the pages a little more colorful (100% inspired by Courtney Diaz over at Little Raven Ink for that one). Journaling or making art is one of my favorite things to do when I can't sleep and/or have anxiety. Also, I should probably alter photos more because I like this. Journaling from a pretty disastrous journey home to Massachusetts for Thanksgiving and I had to include my ticket, of course (also, so cold in Massachusetts in November - kind of forgot that since moving to DC). I still love pages with flip outs and interactive elements. Drawing and writing about what I'm doing at the moment is one of my favorite things. I don't have to come up with an idea about what to draw or write and I also get to look back and remember super mundane, random details, like watching What Not to Wear. Also, my mom is super sweet about my weird need to collect paper and record everywhere we go, so she gave me one of her business cards to put in my journal. Journaling on the road means getting/needing to use random paper and supplies, like this page from a catalog or something. See also little notes about art supplies to try in the top right corner. The return journey on that same trip was also a bit of a disaster and I had enough plane tickets to create a little book. Using scrap paper for backgrounds. When working on this journal I carried around a little pouch with paper pieces, like paint chips, stickers, and labels that I used to break up the pages and add interest, instead of using only found papers. I did some painting and more traditional art in this journal, but a lot of it was used to create backgrounds or to add interest to written words. I love pockets in the backs of my journals. I normally stash notes, or collage pieces inside. Looking back, this journal is definitely one of my most personal. These pages are very far from my more minimalist art style now. I can see myself working to find the sweet spot between writing and art (which definitely fluctuates with my mood and needs at the time). I don't think this is my favorite body of work, although there are definitely some bits that I can pick out to reuse. This journal has my favorite cover of them all - chaotic in the best way.